Franco Pellizotti (born 15 January 1978 in Latisana, Udine, Friuli-Venezia Giulia) is an Italian professional road bicycle racer, currently riding for the Androni Giocattoli–Sidermec team. Pellizotti is known as a climbing specialist and won Stage 10 in the 2006 Giro d'Italia, Stage 16 in the 2008 Giro d'Italia and Stage 17 in the 2009 Giro d'Italia. After finishing third overall in the 2009 Giro, he won the polka dot jersey in Paris as the best climber of the 2009 Tour de France, as well as named the Most Combative (Aggressive) Rider on Stages 9 and 17. At the start of each race, Pellizotti can be seen making the sign of the cross and kissing a crucifix around his neck. On 3 May 2010, Pellizotti's name was released by La Gazzetta dello Sport as being one of several riders under investigation by the Union Cycliste Internationale (UCI) for "irregular blood values". Pellizotti was reported to have had "suspicious values" on the eve of the 2009 Tour de France and request has been made by the UCI for investigation. This was confirmed later that day in a UCI press release. He was due to be one of Liquigas–Doimo' team leaders at the 2010 Giro d'Italia, but was immediately pulled from the squad and replaced with Vincenzo Nibali. His team said they have faith in the explanation put forward by Pellizotti and are conducting a further investigation. Shortly after the end of the season, the suspension was lifted on the grounds of lack of evidence, and Pellizotti declared a wish to seek financial redress from the UCI. 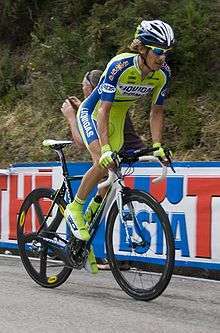 Liquigas–Doimo declined to re-sign Pellizotti after the 2010 season. Pellizotti's case reached the Court of Arbitration for Sport in March 2011. After asking the court for a speedy verdict, he was suspended for two years after it upheld the UCI's appeal. His ban lasted until May 2012. 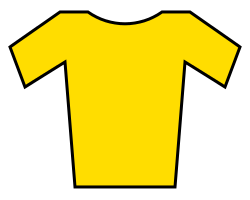 The Court also annulled all results from 17 May 2009, meaning that Pellizotti lost a stage win and third place overall in the Giro d'Italia and a stage win and overall victory in the mountains and combativity classifications in the Tour de France. Following the conclusion of his ban, Pellizotti signed with the Androni Giocattoli–Venezuela team. In August 2013, it was announced that after two years with Androni Giocattoli–Venezuela, Pellizotti was to join Astana for the 2014 season. However, Pellizotti would have only been able to compete from May 2014 due to Astana being a member of the Mouvement pour un cyclisme crédible (MPCC), and that Pellizotti had previously served a two-year ban for a UCI biological passport violation. Further talks between Pellizotti and Astana resulted in his contract with the squad being nullified, and Pellizotti was able to return to Androni Giocattoli–Venezuela for a third season, in 2014. Withdrew = WD; In progress = IP; Voided results = struck through. ↑ "Androni Giocattoli-Venezuela (AND) – ITA". UCI Continental Circuits. Union Cycliste Internationale. Retrieved 8 May 2012. ↑ "Pellizoti Out of the giro due to biological passport findings". ↑ "UCI Confirm Pellizoti investigation". ↑ "Liquigas put faith in Pellizotti". ↑ Brown, Gregor (1 May 2012). "Savio defends Pellizotti's Androni signing after ban". VeloNews. Competitor Group, Inc. Retrieved 8 May 2012. ↑ "Pellizotti signs for Androni-Venezuela". Cycling News. Future Publishing Limited. 30 April 2012. Retrieved 8 May 2012. ↑ "New riders at Astana Pro Team". Astana. Abacanto SA. 1 August 2013. Retrieved 1 August 2013. ↑ Farrand, Stephen (1 August 2013). "Astana's decision to sign Pellizotti goes against MPCC rules". Cyclingnews.com. Future plc. Retrieved 27 December 2013. ↑ Farrand, Stephen (28 October 2013). "Astana accept Pellizotti cannot race until May 2014". Cyclingnews.com. Future plc. Retrieved 27 December 2013. ↑ "Astana and Franco Pellizotti part ways". Cyclingnews.com. Future plc. 9 December 2013. Retrieved 27 December 2013. ↑ "Pellizotti to remain part of Androni Venezuela after Astana deal fell through". VeloNation. VeloNation LLC. 23 December 2013. Retrieved 27 December 2013. ↑ "Bonifazio fastest in GP Lugano". cyclingnews.com. 2 March 2015. Retrieved 2 March 2015.